Aerobic threshold is often defined as the point where blood lactate reaches 2.0 mmol/L. In a few articles and forum posts on this site, aerobic threshold is being defined as the point where fat and carbs each contribute 50% to calories consumed. In the case that these two numbers differ significantly, which one should be used as the top of zone 1? If you have the raw data for your test locate the point where the RER (Respiratory Exchange Ratio) reaches .85. That is also used to locate the point where fat/carbs is at cross over. As you point out 2mMol and crossover do not always match. In my experience; they will for well endurance trained athletes. Why? I’ve had discussions about this with many exercise scientists and there is not one answer. 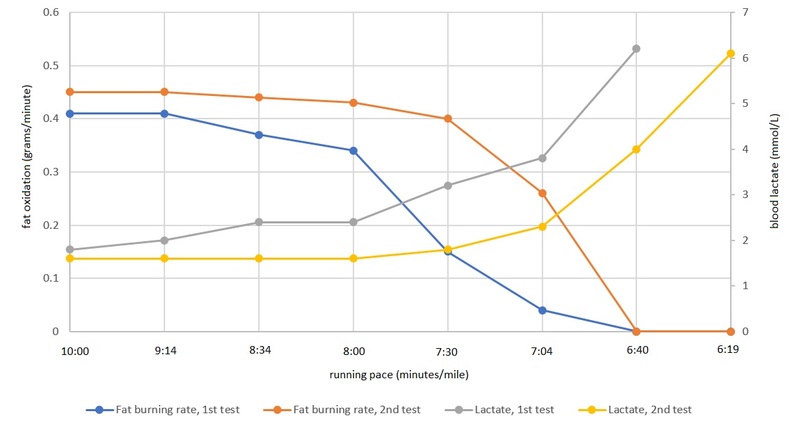 They best I can come up with is that low lactates coupled with a low crossover point is likely due to those individuals who have accumulated a bunch of training volume above AeT having developed a high level of aerobic enzymes that move the pyruvate into the mitochondria (into the aerobic pathway) and hence keep lactate accumulation low. That’s probably more that you wanted to know :-). I suggest training below the crossover point HR even if that is below your 2mMol level. This will ensure increased fat metabolism moving that cross over point up to the 2mMol level which will also begin to move up in HR in response to this same training. thanks for the detailed response. I have the test data, but not RER — the lab already converted that number into fat and carb burn rates. In between those two tests, I did a high volume of (what I thought was) zone 1 cardio, up to 20 hours per week. I picked the top of my zone 1 as 140 bpm and 9:13 running pace, since that was 2 mmol/L lactate in the first test. I generally stayed closer to 130 bpm on longer hikes. If I define my current aerobic threshold, from the second test, using lactate, my AeT is around 155 bpm, at 7:30 running pace. If I define my aerobic threshold as the point where fat and carbs contribute equal calories to metabolism, then it’s slower than any pace tested in the lab. I could try to extrapolate… maybe something like 110 bpm and 12:00 minutes/mile? So, that’s a huge difference, and you can probably see why I’m so curious which pace I’m supposed to train at. Did I misjudge my zone 1 from the first test and overtrain zone 2? Now that I have a good lactate curve but a bad fat burning curve, is the best solution to start a new base training cycle using a lower zone 1 heart rate (under 110 bpm)? Or are the other options, maybe eating a very low carb diet, while continuing to train at 130-140 bpm? If I read your above posts correctly, your 2mMol running pace improved from HR=140 and 9:13/mile to HR=155 and 7:30/mile pace. That is very nice improvement in measurable performance. I’ve seen lots of cases like this myself when I was only measuring lactates HR and pace. In the past I have always seen this also correlate well to fat vs carb usage. However I have begun to see more cases where lactates and cross over don’t correlate so well. If you have been handling a high volume of this aerobic base training already (enough to elicit this nice improvement) then I’d try more fasted runs and a reduced carb diet. The real question will be whether that improves the AeT speed or only moves cross over point to the right. In theory it should do both. Congratulations on making this improvement in 2mMol pace. I suspect that you’ve got more improvements available. 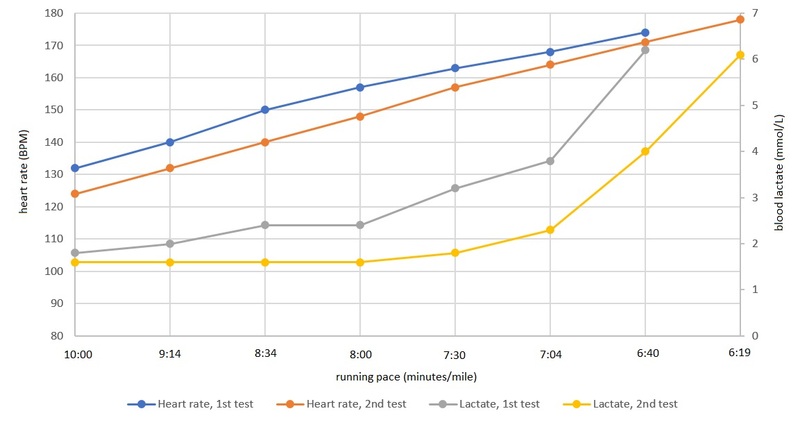 BTW: Have you done a lactate/anaerobic threshold test. Max sustainable pace/hr for 30-45 min? 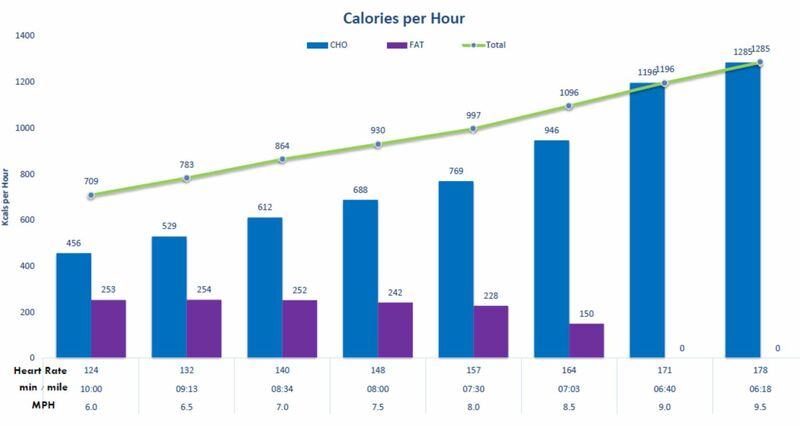 The average HR will be your AnT/LT HR and if it is less than 10% above the 2mMol HR then you need to start adding some Z3 runs. I have a similar issue: my gas exchange test gave an AeT of 145 bpm, but my RER never reaches 0.85, it’s minimum is at around 0.92 at 120bpm. I guess this means I’m in aerobic deficiency syndrom territory and don’t have a fat/carb crossover. Should I train closer to 120 bpm or 145 bpm? I can’t run at 120bpm, even slow jogging brings me to 130 or 135. If you never got your RER below .92 then you are way int to the Aerobic Deficiency Syndrome category and are not a good fat burner. You will reap significant benefits from improving that along. The main side benefit will be an increase in your aerobic capacity. This .85 is often used to define the AeT as well. Doing as many of these very low intensity workouts in a fasted state will speed this change as well. Depending on how much volume you can do expect to see increases in this 120 pace in about 8 weeks minimum (training 10-18 hrs/week) and 12 weeks if training under 10 hrs/week. many thanks for this advice, which is what I expected. I will try to put this into practice as well as possible. It’s also a bit shocking, since I’ve been able to do fairly long ski-mountaineering trips up to 7000ft vertical per day and quite a few somewhat technical alpine 13’000ft-14’000ft peaks, but I guess I did so on carbo-fuel. I’ll need some low-impact exercise to put in the high volumes (and as said, running does not seem ideal as my HR goes to around 128bpm at a 12min/m pace…). Uphill hiking would be ideal but requires some “commuting” time, so I am looking for alternatives which allow me to squeeze in a maximum of training time with as little wasted time as possible. I would assume long walking workouts on a maximally inclined treadmill should have good if not perfect transferability? I’ll also do more long bike rides – I’m aware of the limited transferability, but it allows for long rides at low bpm’s. On the diet side I see the point and have read some interesting research on how effective it is. So I’m quite convinced that it’s very good advice. However, I’m not quite ready to switch to so much meat as seems required (ecological footprint as a reason among others), but I have started to avoid sugary food as much as possible and replace the sugar calories with fat (olive oil, avocaco, greek yoghurt). I hope this will help a little bit… Or is there a way to have a fat-centered diet without massive amounts of meat?? I’ve also stopped eating before workouts, so those are not perfectly fasted (as rarely in the morning), but at least less carbo-loaded. So, I’m looking forward to seeing how this works out. Since starting training, I have been amazed how quickly my pace at 137bpm improved (from almost 12min/m to 10min/m in 6 weeks), so I hope to see similar improvements at these lower bpm’s. You talk of “minor changes in diet” – but what are these recommended changes? I have not seen any description of the diet you recommend on this site nor in TFTNA as far as I remember? As said, a true ketogenic diet to me seems much more than a minor change in diet, but if there’s a less radical way I’d be very interested! As always, thanks a lot for all the time you take to reply here. It’s an awesome privilege to have this interaction with you Scott in particular, and the other atheletes as well. I have slowly been transitioning to a fat adapted diet. I eat a lot of nuts and a lot of cheese (though I appreciate that dairy might have some of the issues with ecological footprint that meat consumption does). I have also started taking protein powder as I have found that getting enough protein simply via meat/dairy is quite difficult. The easiest big change for me was just cutting carbs from dinner – so no potatoes/rice/pasta etc., just meat or fish plus salad/vegetables. Cutting carbs from breakfast (muesli) is the next challenge but is tricky as muesli provides a lot of calories at fairly low cost with no cooking required. I have definitely noticed a difference – it used to be when I went hiking, I felt I never had enough food. On the last couple of long hikes I did, I came back with plenty of food left in my pack. I prefer to use Dr Phil Maffetone definition of aerobic threshold. 180hr – age – adjusted up or down slightly according to the individual training history. Everything under this is classed as aerobic whilst everything above is anaerobic. I know its not perfect but for me works better than having lots of different zones which I think over complicates things. Thanks Mariner, that’s helpful. I’m trying to slowly transition as well, and also have stopped eating before the Z1 workouts. Too early to say whether it has an impact, but it feels good so far. I don’t know a lot about endurance training but I have to wonder if there is an age difference between those reporting success with the MAF method and folks like myself, a 45 year old, who find it lacking. I used the MAF method for a year and felt like I lost a lot of strength and speed with no noticeable endurance gains. I never felt like it was enough stress to stimulate adaptation as using the MAF formula put me at 135 BPM for my AeT. Really boring way to spend a couple of hours trail jogging and walking up any hills as well. I’m only training 5-8 hours a week now and have increased my (treadmill nose breathing tested) AeT of 151 to 155 in 3 months using the TFNA principles. I can actually run all but the steepest trails now, it’s much more fun. RPM – I’m not an exercise physiologist or expert but I do have a fair amount of endurance training background. My MAF HR (152 = 180-age no adjustments seems to correlate well with my aerobic max. I don’t always like the nose breathing method as I’ve found with practice I could if I wanted take really deep nose breaths whilst above MAF – in the black hole. I understand where you are coming from but if I was training at 16-18 beats above MAF – which would be the high 160s for myself – I would hit overtraining quite quickly and also that would be a very hard workout for me, certainly not a base endurance building workout. I’d agree MAF might not work for everyone but 151-155 seems too high for a 45 year old. If they got the numbers correct, Adrian had a fat/carb crossover point at 115 bpm, but picked 135 bpm as his zone 1 and ate a very high fat diet. That raised his crossover point to 140 bpm. So, there’s one data point suggesting that you don’t need to slow all the way down to the crossover heart rate, if you’re a really bad fat burner.